The 2019 Toyota Tundra returns for another year as a rival for the big full-size pickup trucks from Ford, Ram, Chevy, and GMC. Updated in 2014, the Tundra comes only with V-8 power, but it’s offered in seven different trims. This year, the TRD Pro edition gains new shock absorbers; otherwise the Tundra carries over with no changes. The two V-8 engines are a 4.6-liter with 310 horsepower, and a 5.7-liter with a stronger 381 horsepower. Every Tundra uses a 6-speed automatic transmission, and comes in rear- or four-wheel-drive form. The Tundra’s quiet and the ride is comfortable, and it steers well. With the bigger engine and four-wheel drive, the 2019 Tundra is EPA-rated at 13 mpg city, 17 highway, and 15 combined. The smaller V-8 with rear-wheel drive is slightly more efficient. Tundras can be ordered as extended cabs or as crew cabs. Depending on the cab, the Tundra can come with a bed of three lengths: 5.5, 6.5 or 8.1 feet. Crew cabs have plenty of interior space and can be finished with swanky trim packages like rival pickups. The 2019 Tundra leads in standard safety equipment, with automatic emergency braking with pedestrian detection, adaptive cruise control, lane-departure warnings, and automatic high-beam headlights. Blind-spot monitors are an option. The Tundra earns four stars overall from the NHTSA. The Tundra’s seven models are SR, SR5, Limited, 1794 Edition, Platinum, TRD Sport, and TRD Pro. About $32,500 will buy you an extended-cab SR with power features and a 6.1-inch touchscreen for infotainment, and the standard active safety technology. A Tundra SR5 with the popular crew-cab body costs about $34,500, and comes with chrome bumpers, upgraded infotainment, intermittent wipers, and a few other features. The 5.7-liter V-8 makes its appearance beginning with the Tundra Limited, for about $44,500. It’s well-equipped with heated leather seats, dual-zone automatic climate control, a tow package, navigation, and more. For about $51,500, the Tundra Platinum and 1794 Edition trims have softer leather, JBL audio, cooled front seats, 20-inch alloy wheels, and different styling themes. The Platinum has a monochrome look with dark hues inside, while the 1794 Edition has southwestern-inspired trim colors. The Tundra TRD Pro costs about $50,500 and includes Fox shocks, 18-inch wheels wrapped in Michelin all-terrain tires, LED headlights, skid plates, leather seats, and a moonroof. The Tundra looks like the big truck that it is, with a tall and wide grille, beefy fenders, and billboard-sized badges. If you like chrome, you’ll like the SR5 and 1794 Edition; if you don’t, you’ll prefer the monochromatic Platinum and TRD Sport or Pro. The dashboard is wide and symmetrical, with controls grouped either in the center below the 6.1- or 7.0-inch touchscreens, or to the left of the steering wheel. The Limited and 1794 Edition have nice stitched vinyl and woodgrain trim on their dashboards. The extended-cab Tundra SR, SR5, and Limited have good room up front and wide, well-padded seats. A bench seat is standard on SR and SR5, but buckets with a center console are more common. Extended-cab Tundras don’t have great space in the second row, but it’s good enough to get by for short runs. The crew cab is a better choice for carrying passengers in back. The rear seat is flat and upright but legroom is excellent. Both V-8s do the job, whether the 4.6-liter with 310 horsepower on the SR and SR5, or the 5.7-liter with 381 hp on the other models. The engines are smooth at low rpm and each can tow up to 10,300 pounds when properly equipped. The 6-speed automatic is slick-shifting and programmed for the shifts to come in the correct places. It’s predictable. The ride is soft and generally composed and isolated even over rough pavement. It tracks better than most. With an empty bed the Tundra can be bouncy, but so can any full-size pickup. The TRD Pro has upgraded Fox shocks that are tuned to handle just about any bump that might be encountered. They improve the highway ride while making the Tundra better for bounding over dirt roads or in the sand. The steering is heftier than some rivals, while the wide turning radius can make it ungainly in parking lots and tight spaces. It maneuvers like a truck. 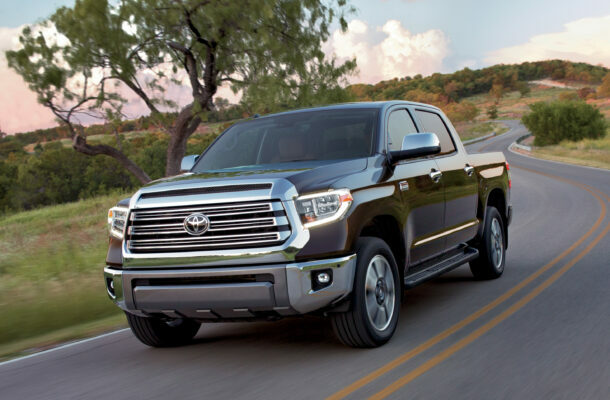 The 2019 Toyota Tundra puts its best foot forward in smooth V-8 power, and in extensive safety gear. Other trucks have higher tow ratings or more lavish special editions, but the Tundra’s record for durability is good enough reason to add it to a test-drive list.